Swiss Chard, Walnut & Miso Pesto | Grow Your Own Veg Blog. Gardening and Food Blog. 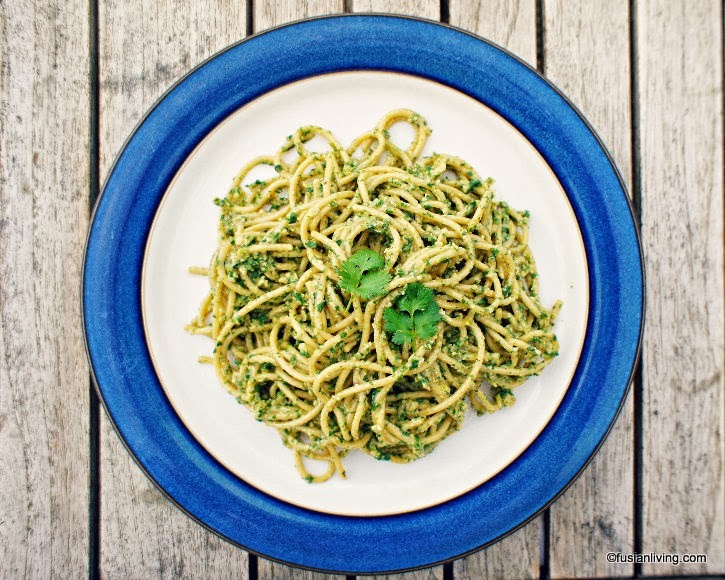 A Swiss Chard Pesto recipe infused with Asian ingredients. When it is overcast and grey outside, and large drops of rain have begun to fall from the skies, there is little motivation to tend the vegetable patch, and all I want to do is huddle up indoors with some nourishing, comforting food. It is days like this that I dream of wholesome spaghetti drenched in warm, delicious green nuttiness. There is Swiss Chard growing in the kitchen garden, so I seize the opportunity to dash to the bottom of the garden, before the rain really starts to pelt down, to grab large handfuls of dark glossy leaves and stems that are in varying rainbow coloured hues. A jar half full of miso paste sits in the fridge, a remnant from all the other gloomy days like this, where a teaspoon of miso topped with boiling water has allowed for a quick but satisfying fix. But today, this miso is going to be the star ingredient, adding intensity and depth of flavour to a sauce that I am going to make. It's a kind of Japanese inspired fusion pesto, with lots of green, lots of nuts but minus the dairy component. In a pan over low-medium heat, add some olive oil. Then, add the swiss chard stems, salt and whole cloves of garlic (with skins left on). Sautée for about 5 minutes until stems are softened. Then, add the leaves and cook for a few more minutes until wilted. The garlic will also be roasted in their skins. Discard the garlic skins. In a separate dry pan, lightly roast the walnuts. Remove from pan and allow to cool. Cook the spaghetti according to the pack instructions. Drain well. processor and pulse. Gradually add the olive oil, and continue to pulse until you achieve a pesto like paste. 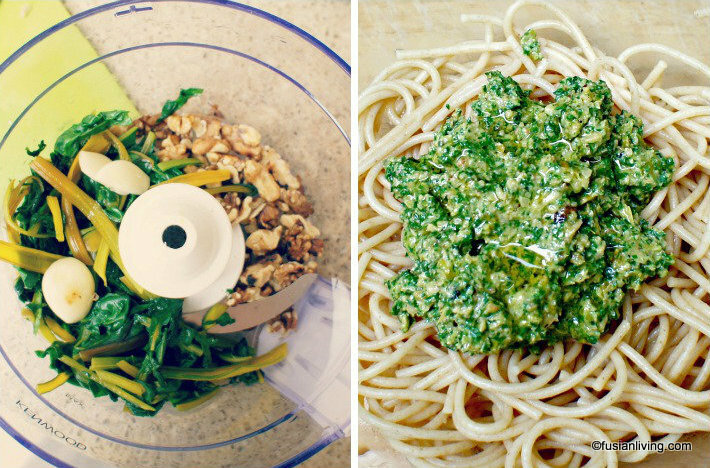 Mix the pesto through warm spaghetti. Garnish with some finely sliced spring onions and baby coriander leaves. Thank you to Sainsbury's for sponsoring products from their SO Organic range.